Located just 500 metres south of Marine Gateway is the mighty Fraser River. Before modern-day technology and transportation options, it was the Fraser River that sustained the livelihood of the First Nations and was the catalyst for much of the exploration, industry and transportation of the British Columbia mainland. 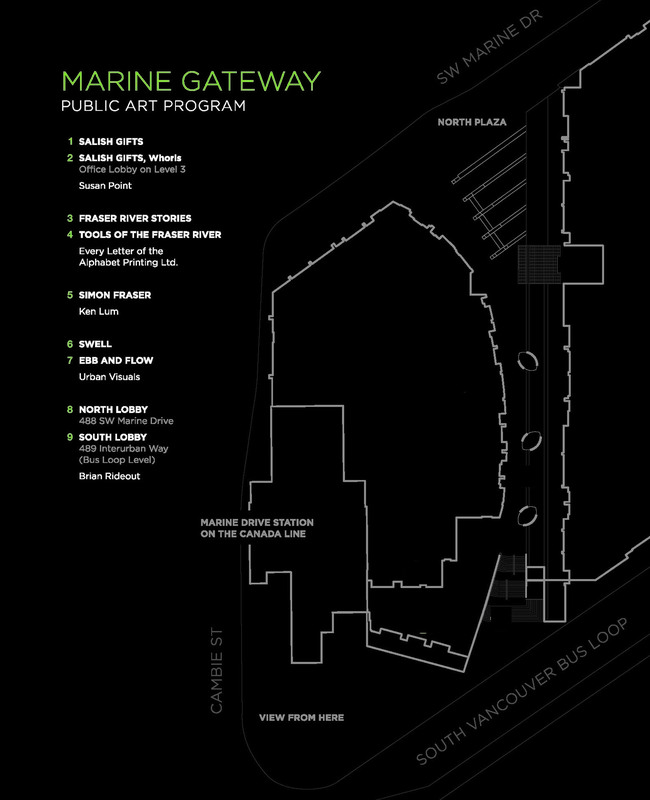 Throughout the planning of Marine Gateway, a significant and exciting component was always its extensive public art program. This was an opportunity to celebrate the Fraser River and its catalytic role in the creation of British Columbia in a highly public and interactive environment that encourages curiosity, contemplation and reverence. 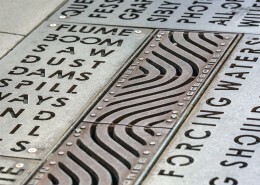 The intent was to commission works that enrich the environment and engage the viewer while speaking to the city of Vancouver and the evolution of the area, beginning with a tribute to the First Nations and moving through the voyage of Simon Fraser and recent transportation and industrial past. 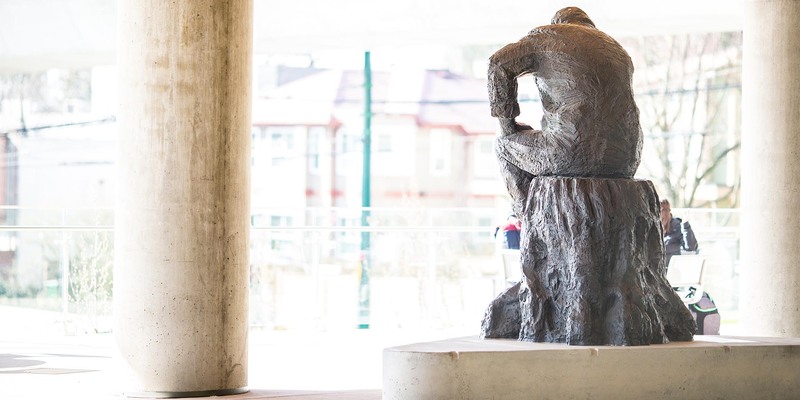 We invite you to explore and to enjoy the history of the Fraser River as represented at Marine Gateway. 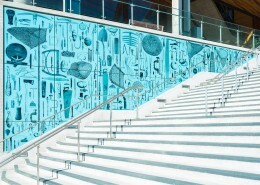 The City of Vancouver’s Public Art Program in 2016 celebrated 25 years of overseeing the production of extraordinary artworks for public places in Vancouver. The Program aims for artworks that give voice and expression, in symbolic form, to the spirit, values, visions, and poetry of place that define and inspire our city. The collection of artworks commissioned by Marine Gateway admirably achieves these aims. As the following essays show, the artists whose works are sited around the buildings all follow – in subject matter, materials, and means of execution – widely diverse art practices. 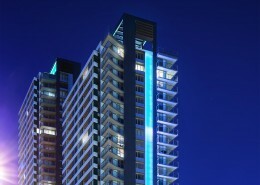 But all demonstrate an international level of excellence, while saying something unique and true about Vancouver. Viewers who take the time to regard, research, and explore these works and their creators will come away with a deeper appreciation of the place and culture we call home. And those who reside here may take some satisfaction in knowing that their homes are part of an international movement seeking to incorporate the best contemporary art into the everyday settings where they live. FIRST NATIONS. 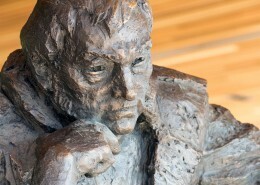 SIMON FRASER. TRANSPORTATION. INDUSTRY. 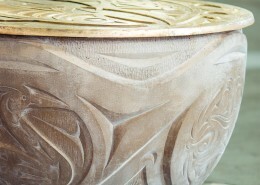 The overall theme of the Marine Gateway Public Art Program is inspired by the significance of the Fraser River and explored through primary guiding themes of First Nations, Simon Fraser, Transportation and Industry. 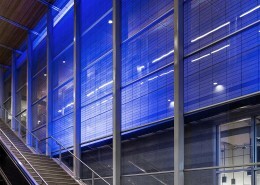 The artworks come in range of presentations, from distinct sculptural and traditional forms such as Musqueam artist Susan Point’s Salish Gifts, Ken Lum’s Simon Fraser and Brian Rideout‘s North Lobby and South Lobby to works integrated directly with the public landscape and building architecture, including Geoffrey Farmer’s Fraser River Stories on the High Street ground plane and Urban Visuals‘ 55-metre light installation Ebb and Flow on the exterior façade of the south tower. The Marine Gateway Public Art Program currently comprises eight commissioned public art pieces by five prominent Canadian artists. 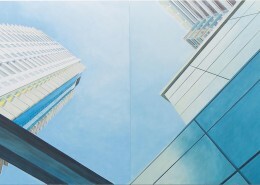 All the works can be seen or interacted with in the High Street or in the office and residential lobbies. Additional works are underway for the collection, with details to be published on the Marine Gateway website once complete. The City of Vancouver, PCI Developments and the parties involved with the development of Marine Gateway are excited by the robust and high-quality collection of works, which will endure and be enjoyed for generations. Landscape Architect: PWL Partnership Landscape Architects Inc.